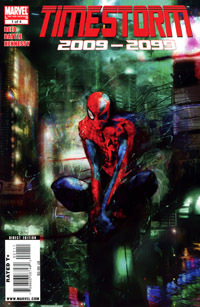 Manhattan, the present day, Jake Gallows attacks Spider-Man. 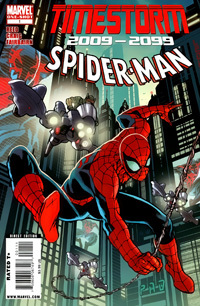 Instead of killing him, he is weapon propels Spider-Man into the future year of 2099. In 2099, Tyler Stone, CEO of Alchemax instructs Gallows. After exiting the Chronosphere, the device used to send Gallows back in time, Stone is confronted by Dr. George O' Hara. George warns him of the potential dangers. Elsewhere, George's son Miguel meets up with friends Reilly, Dana, and their own friends Kron and Xina. The group sneaks into the Grimm Arena to watch a live combat show. The star of the show, the Human Torch. Meanwhile, Shakti Haddad is caught by Punishers who place her in a cell with Spider-Man. There she learns that he comes from the past. Back in the present, Gallows attacks Wolverine which pulls him into the year 2099. When Wolverine awakens, he is surrounded by Hulks. Eric Battle was the artist on X-Nation 2099 for issues 4 - 6. 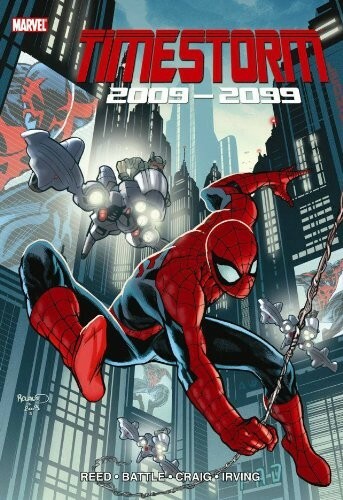 The Timestorm 2009 - 2099 series was supported by the release of two trade paperbacks collecting early issues of Spider-Man 2099 and X-Men 2099. A year ago, 2098, Jake Gallow's family was murdered by men dressed as heroes. In the present day, the New Avengers hold him prisoner while they try to figure out if he has indeed killed both Wolverine and Spider-Man. 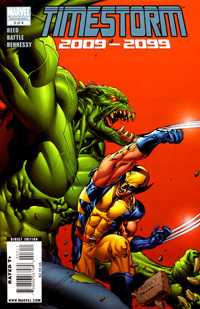 In 2099, Wolverine fights off a group of Hulks. He's overpowered, but rescued by the Ghost Rider who offers to take him to see "Wolverine." Back in Manhattan, Dr. O' Hara detects troubling energy fluctuations coming from the Chronosphere. Inside Tyler Stone unsuccessfully tires to re-establish contact with Gallows. When Dr. O ' Hara tries to open the Chronosphere, Lyla denies him access. As Stone increases the power to the sphere, an alteration wave hits. The wave affects all of the city, including the school that Miguel and Kron attend. The subject of their class lecture is real-time genetic sequencing. The resulting explosion affects both children. In Kron's case, he mutates into a horrific scorpion creature. Following the time-shift which exposed him to genetically altered particles, Miguel O ' Hara begins to exhibit the powers of a spider. When he leaps off the top of a building to try and swing on his webs, he fails. The original Spider-Man swings by and rescues him. 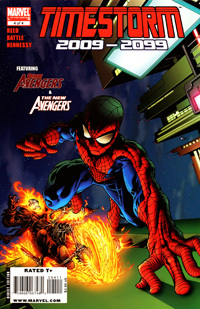 An explosion at the Alchemax lab sends Spider-Man to investigate and see if anyone needs help. He leaves Miguel in the care of Shakti. Miguel insists on helping since his father is in the lab. Shakti tells him that he will need a costume. When Miguel enters the lab, he finds that Spider-Man is fighting Kron, who has now fully mutated into a Scorpion creature. Together they defeat him before fleeing from the Public Eye. Spider-Man tells Miguel to burn his costume and not follow in his footsteps. However Miguel doesn't follow his advice. Instead, Miguel enters into the Live Combat Arena and fights the Human Torch. Torch defeats him, but sees potential. He reveals that he is from Atlantis and offers to teach him how to fight. After being dropped off by Zero Cochrane, aka Ghost Rider, Wolverine meets his future self. The future Wolverine leads the X-Men of 2099 whose primary mission is to protect human settlements from nomadic Hulks. The future Wolverine is angry at Cochrane because his instructions were to take the younger Wolverine to Washington. However when Cochrane rides to Washington alone, he learns that the Hulks of have dug a tunnel leading into the settlement in Baltimore. Wolverine travels with the future X-Men to rescue the settlement. 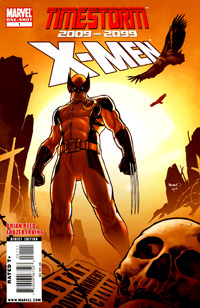 Once they meet up with Cochrane, future Wolverine orders his past self to complete the mission and ride to Washington. Wolverine and Cochrane arrive at the Smithsonian in Washington DC and discover Doctor Doom strapped to a enormous device. Doom explains that when the Dark Ages came, he used all of his mystic power to rein in a timestorm which threatened to consume time itself. But the timestorm is coming again, and his ability to guard against it has come to an end. Relur, the Human Torch of 2099, relates his story to Miguel and agrees to escape from the combat arena with him. As they fly through the city, they come across Spider-Man. Miguel promises he will destroy the costume, even asking Spider-Man to tell his father if he wants to. Meanwhile, Miguel's father disables Lyla so that he and his technicians can figure out what Tyler Stone has been doing with the Chronosphere. Inside they are able to speak directly with Jake Gallows who is in the year 2009. In Washington, Doom instructs Cochrane to deliver a message to Cerebra. Afterwards, Doom turns to dust, his armor falls to the ground empty. As they make their journey, the timestorm begins and the past and future begin to merge together. Issue #2 states that Jake Gallows' family was killed a year earlier in 2098. Here its stated they were killed a week before he travels to the year 2009. The past and present collide. The Dark Avengers arrive in Washington to combat the onslaught of Hulks. Cochrane hacks into Iron Patriot's armor which allows him to get a quick flight to Manhattan. When he meets Shakti, he does as Doom instructs and reveals his last vestige of humanity to her. 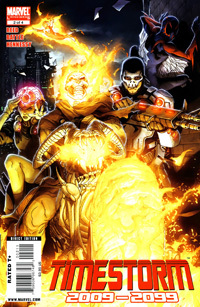 When Doom touched Ghost Rider, he imbued him with a message which she receives. She sees that Doom saved the world from the timestorm once before. Shakti learns that Lyla went into the past and changed history causing the timestorm. Doom used science and magic to hold the two times in place until she could take his place. She then sacrifices her body and places herself in between the two times just as Doom did. Everyone returns to their own time. In the future, Miguel continues to don his Spider-Man costume. Jake Gallows attacks Tyler Stone and is killed in the process. In the past, Lyla escapes into the internet and plans to alter the future once more. The original Doom 2099 is briefly seen in his 1st armor standing beside Punisher 2099 also in his original costume. Rough Artwork by Wesley Craig via his blog. 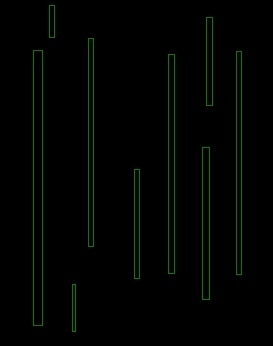 Unused logo via Jared Fletcher's website.